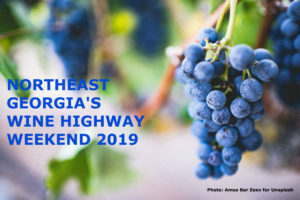 The annual Georgia Wine Highway Weekends return to the mountains of northeast Georgia March 22-29, 2019. Despite its name, the popular event actually takes place over ten days, and provides a great introduction to one of the top wine areas of the region. Sponsored by the Winegrowers Association of Georgia, Wine Highway Weekends includes eight wineries in the area around Lucille’s Mountaintop Inn & Spa, plus one meadery—so staying with us is a must! Taking easy little drives from here you can visit beautiful vineyards, tour the wineries, and sample a range of varietals. Visitors to the event pay a one-time $50 fee to receive a Wine High Weekend collector’s glass and passport, which is their ticket to all participating wineries. (So hold on to them both!) Each winery will offer a unique open house, many offering food and wine pairings, music, barrel wine tastings, and more. Be sure to contact each winery to double-check their hours during the event. A listing of phone numbers and websites for each is on the Wine Highway Weekend website. Fridays, 12:00 p.m. – 5:00 p.m.
Saturdays, 11:00 a.m. – 5:00 p.m.
Sundays, 12:30 p.m. – 5:00 p.m.
Monday – Thursday, 1:00 p.m. – 5:00 p.m.
Lucille’s is proud to offer many of these local wines for purchase, so you can continue enjoying the wine weekend nestled back here at the Inn. Call today to make a reservation of, if you prefer, book online! This entry was posted in Food and Drink, Georgia Bed and Breakfast, Georgia Mountains, Georgia wineries, Georgian Mountain Festival, North Georgia Wineries, Scenic drives and tagged Georgia Bed and Breakfast, Georgia Mountain Activities, Georgia Winery, North Georgia B&B, North Georgia Wine Country, Wine Highway Weekend, Wine Tasting by admin. Bookmark the permalink.